OEM Replacement or custom design edges, heat-treated or high-carbon steel, tungsten carbide-inserted edges, carbide impregnation, plow shoes, curb runners, and nose pieces. Joma 6000 flexible carbide-inserted edges, SnoShock cushion-mounted carbide blades. BladeRunner extended wear life blades are premium alloy steel blades designed to extend the wear life of the edge, reducing the need for blade changes. These high-strength blades will bolt to virtually any snow plow or motor grader and are to be used where the customer requires longer blade life but tungsten carbide inserted blades are not practical. The BladeRunner will withstand impact and rough surfaces that would normally fracture carbide blades. 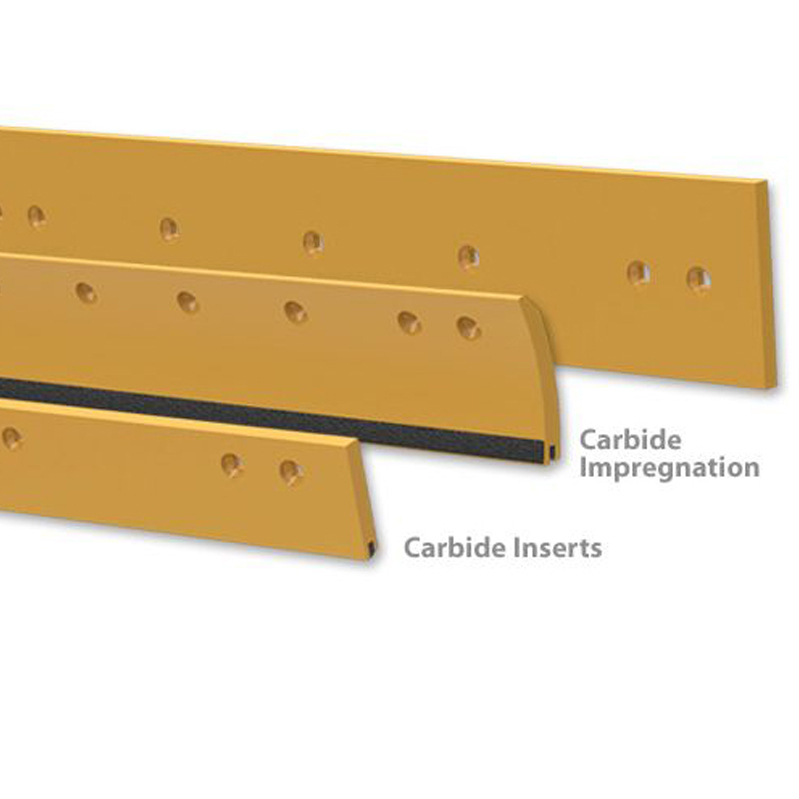 Carbide insert blades for snow plow applications are available in four profiles: 3/4 x 5, 3/4 x 6, 7/8 x 5 and 7/8 x 6. Insert blades for underbody plows are also available. They come with backside top bevel to allow for the step in the moldboard. Trapezoid-shaped inserts can be brazed into the blade backwards to create a cleaner road surface, allowing for the back dragging of some underbodies. The JOMA 6000 blade is a unique design incorporating tungsten carbide inserts brazed into specially profiled steel segments which are then encased in rubber. The result is dramatically superior life when compared to existing carbide-insert blades. Numerous other benefits are sure to increase the availability of your plow and reduce costs related to winter highway maintenance. carbon, heat treated, carbide inserted, Joma 6000, nose shoes, curb runners and bumpers, runner shoes, and blade supports. 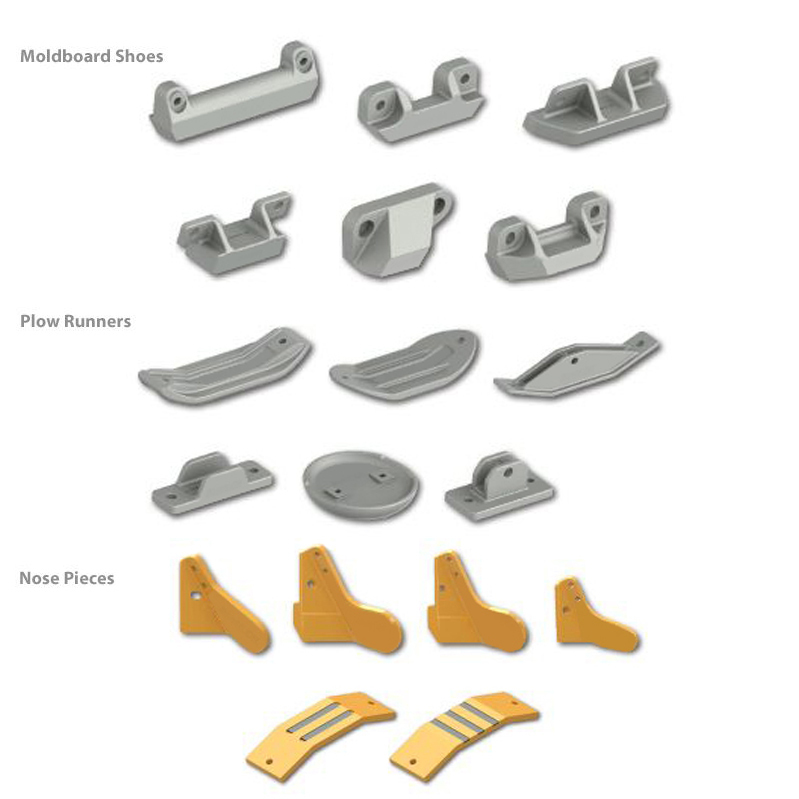 Tungsten Carbide Tiles or inserts can be added to any alloy steel runner shoes or nose pieces to increase the wear life in demanding applications. 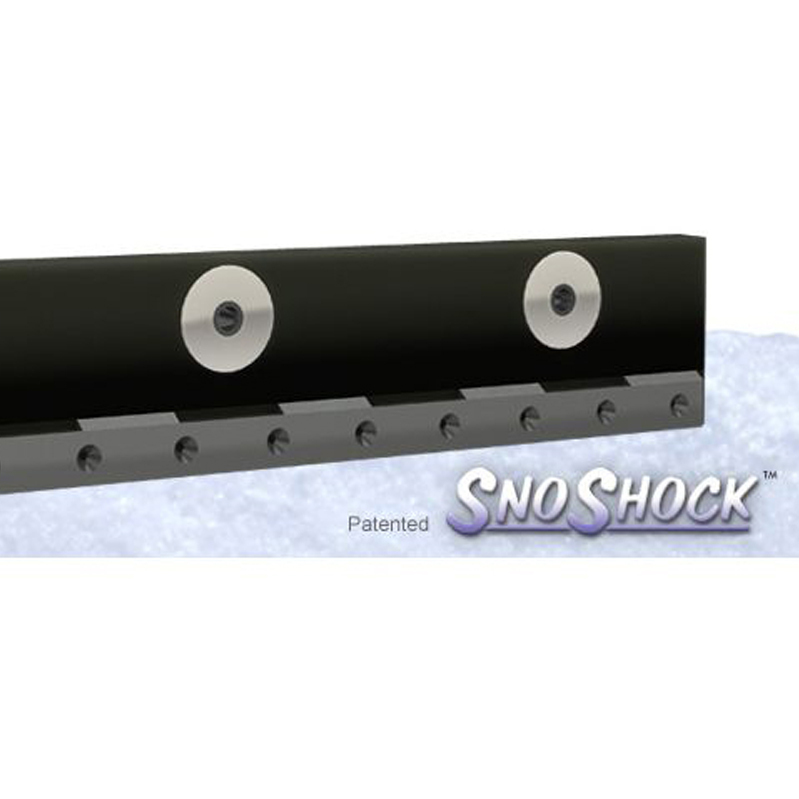 Black Cat SnoShock plow blades are just that, snow plow blades with built in shock absorbers. Replacing the normal mounting holes in the steel blade with specially designed poly bushings allows the blade to move and float under the weight of the plow. This cushioning effect absorbs the shock and impact normally transmitted through the blade, virtually eliminating carbide insert fracturing. The result is dramatically longer blade life. An integrated “Shield” is designed into the face of the blade to further protect the carbide inserts and keep the steel “holder” blade from prematurely wearing. A hardened steel clamping blade is used over the face to mount the assembly to the plow. 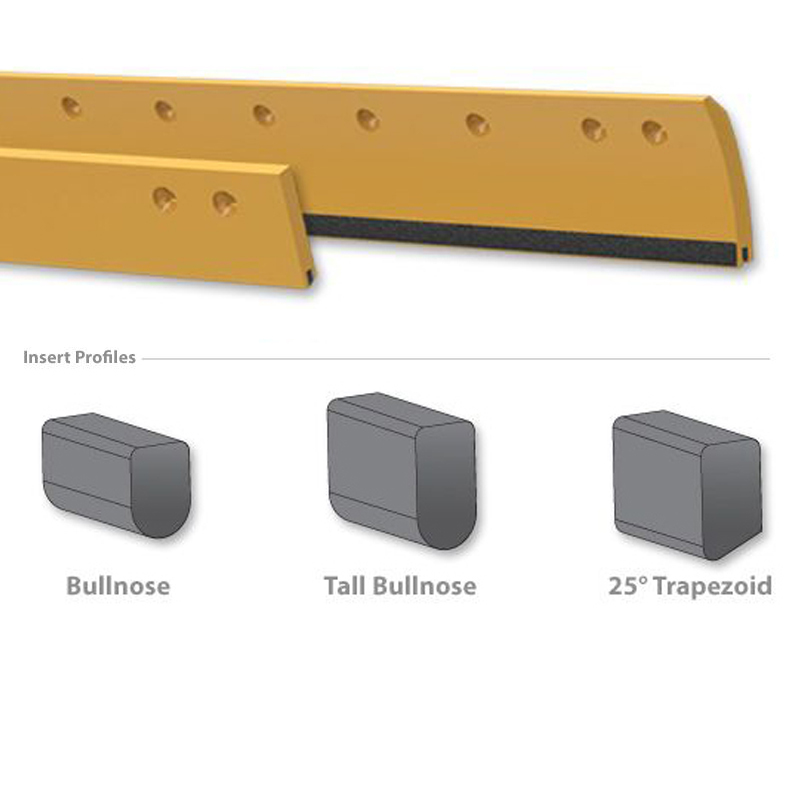 Black Cat plow blades are currently available in 7/8” x 6” profile and come standard with Black Cat tall bullnose inserts, offering the user exceptional blade life. Other insert shapes and sizes can be ordered. 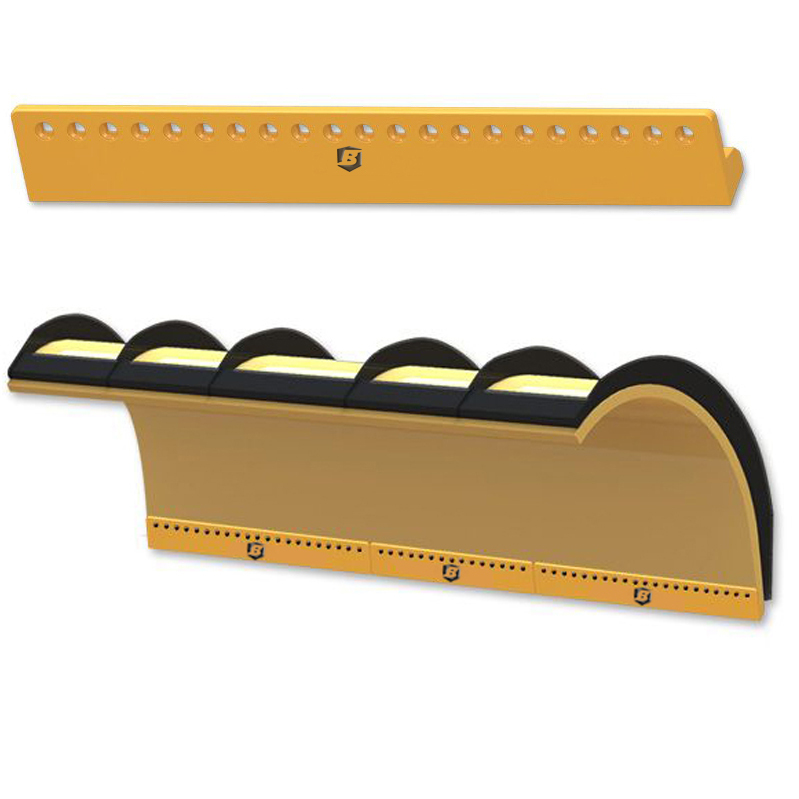 Configurations are available for plows with 5/8” or 3/4” holes on 12” or 8” hole spacing. Snow plow blades come in a stunning number of configurations and spacing. Standard highway punch (3-3-12 spacing) is the most common, but even that has options. Plow blades come with countersunk holes for plow bolts, square punched holes for carriage bolts, or round holes to accept hex bolts. Users and manufacturers have a range of gauge (distance from the top of the blade to the center of the row of holes) specifications as well. 1-1/2” is the most common, but this varies from 1” for some of the smaller pickup truck blades to center drilled on some of the highway plows and wings. Snow plow blades are often clipped, particularly with V-plows. They can be clipped on one or both sides and with one or two clips on each side.